Standing among a large gathering of thousands of people, comedian and columnist for The Guardian Corrine Grant wondered why so few people had come. 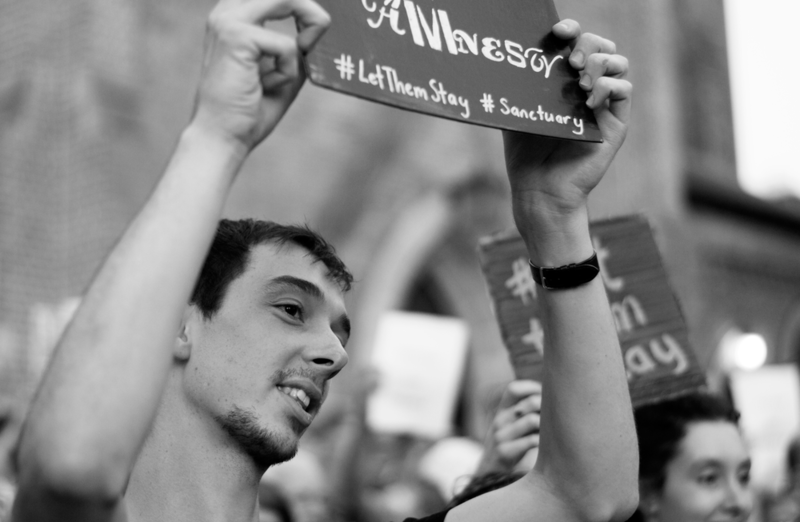 Grant was at Melbourne’s ‘Let Them Stay’ rally—one of many held across the country last week, protesting the Australian Government’s policy of offshore immigration detention, and the return of 267 people to Nauru, including 91 children. In Perth on the same day, I was at a ‘Stand For Sanctuary’ vigil at St. George’s Cathedral, along with 1500 others. It was fantastic event, but I too looked around and had a pang of doubt. It was a lot of people for sure, but not an overwhelming turnout. Then I had a terrible series of thoughts. Where is everyone? Don’t people care? Or is it that more Australians are interested in booing Adam Goodes than are willing to boo child abuse? “We turn a blind eye to the atrocities we are inflicting on innocent people – the murders, the rapes, the denial of proper medical and psychological care and the child abuse – because we are selfish. I understand her pessimism. Although it’s heartening to hear that a Brisbane children’s hospital has refused to discharge a baby due to be returned to Nauru, and that nearly all our State Premiers have offered to provide housing and support to asylum seeker children, I’m troubled by a few questions. What does the rest of the country think? Where are we on this? It’s been eight years since Prime Minister Kevin Rudd said ‘sorry’ to The Stolen Generations. Eight years and five Prime Ministers—two of them Rudd himself. His ‘sorry’ speech was amazing. It was a vital turning point in our history—an important first step, as he said, “to remove a great stain from the nation’s soul”. But Prime Minister Rudd was also the architect of a policy not to resettle asylum seekers in this country—a legacy of the preceding Howard Government. Delivered in 2013 on the March 21, few people heard the speech and not many news outlets had space to report it. It was the same day as the leadership spill that saw Prime Minister Rudd returned to office. And so another curtain was quietly drawn on a terrible period in our history, with no feeling of resolution. Then, when Prime Minister Tony Abbott took office, things got uglier. Way uglier. There were allegations that the Australian Government had paid people smugglers to return to Indonesia with their human cargoes, and the threat of prosecution to any detention centre staff who spoke out about conditions in the camps. The Australian Human Rights Commission also delivered its “The Forgotten Children” report. The report described the many failures of Australia’s offshore detention strategy, including numerous cases involving child assault, sexual assault and self-harm. It was immediately decried, ignored and was the subject of grotesque contortions of logic—that the policy reduced the number of children in detention (it didn’t), that it was compassionate (it wasn’t), and that the commission should be ashamed of itself for being “blatantly partisan” (even though it was critical of the policies of both parties). But as yet, Prime Minister Turnbull has done nothing to end the policy, with many commenting that this might be due to large-scale support in this country for its continuation. Which is precisely what will happen if we let this moment pass behind the shroud of history. This abuse is happening right now. Saying sorry later will be an inevitable and important gesture for future generations, but will we, this generation, be able to live with ourselves? Land of hope or despair? Not only are successive Government immigration policies cruel, inhumane and possibly illegal, right now I feel we’re fighting for our nation’s soul. Do we really want child abuse to be part of our national story? It was hard enough to own up to our treatment of Aboriginal and Torres Strait Islander peoples, adoptees and their parents. Do we really want to add more child abuse to this country’s CV? I think if we as a nation want to claim the sacrifices at Gallipoli as our own, then we should be prepared to make some sacrifices too. If we want to align ourselves with the heroes of the Kokoda Trail, then let’s be heroes to those who have suffered the same hardships or worse getting here by boat. If we want to say that being Australian is about mateship, then let’s be mates; and if we want to say that Australia is a place where people get a fair-go, then let’s give people one and not just say it. They say 70% of Australians support offshore detention, but I don’t think that’s necessarily true—at least I hope not. If you asked people whether they think refugees should live in filth, in fear of violence, in a hell-hole that costs tax payers over one billion a year, that number would shrink. And if you asked people if they thought a child, who had allegedly been raped while in detention, should be put back in the very same place where he had been assaulted, potentially to be a victim of the same person again, that support would be gone entirely. Digging around on Facebook, I found the person who took the photo: photographer, lawyer, activist and philosopher, Siobhan Marren. After asking for permission to use the image, I was curious what she thought about the protests, Corinne Grant’s piece, and whether she too suffered bouts of pessimism. I agree, but what I like about Corrine Grant’s piece is that it calls into question our national self-image. Are we lucky and generous, or lucky and selfish? If you’re concerned about this issue too, Deputy CEO Kate Elizabeth from Welcome to Australia has some great suggestions on how you can get involved. This is the third time I’ve written about this issue. Here’s parts one and two.